YB Chris Lee Ching Yong, Pegawai Khas kepada Menteri Besar Johor merangkap Pengerusi JPMM Kawasan Bentayan addressing members of the Malaysian Ceylonese Congress, Muar Branch on the ocassion of their BGM/Dinner on 1st July 2010 at Restaurant Sing Kee Ting, Jln Khalidi, Muar. YB Chris thanked the members for their continued support . The telephone number for MCC headquarters is 03-62582458 . The scholarship will cover tuition waiver for the period of study. BRICKFIELDS ASIA COLLEGE has been offering several courses and they include legal studies, business studies as well as pre-university courses. Candidates applying for the scholarship must have good academic records at SPM or its equivalent. For instance, they should have a minimum of five (5) Bs including credit passes in English and Mathematics. Candidates can apply now using their final term exam results. The candidates should also ideally excel in extra-curricular activities and have demonstrated a commitment to community service. Applicants must not be holding any other financial award from another organization and they must be willing to provide evidence of financial need. To be eligible for the award, monthly income of applicant’s parents should not exceed RM5,000. For information about BRICKFIELDS ASIA COLLEGE, please visit website www.bac.edu.my or call 03-22744165/03-22744174. 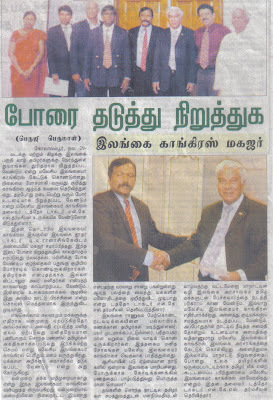 Malaysian Nanban 29 Nov 2008, on visit by MCC Delegation to Sri Lankan Hihg Commission in Malaysia. MCC President Dato' Dr NKS Tharmaseelan handed over a protest note to High Commissioner Dr.D.D. Ranasinghe. MCC Since the Birth -1958.